Apollo 12 Astronaut, Alan Bean at home with 6 year old daughter, Amy. Previous post#5 Fear has no place here. Amy, that’s beautiful. I never got to meet your dad, but it sounds like he was not only an accomplished man, but a loving, wonderful father. I’m so sorry for your loss. Your father touched so many lives, including mine and my sons. I can’t imagine how much you are missing him. I’m so sorry for your loss. GOING TO MISS YOU MY FRIEND! Thanks for that personal side of your father. As a child growing up during Apollo, all the astronauts seemed larger than life. My dad taught me despite all the heroics they were still regular people. I always thought your dad was special. He never showed that cocky test pilot attitude or the superior attitude of a brilliant mind. He always seemed so down to Earth and warm and friendly. I was so hoping to meet him this year and will miss him greatly. I definitely will miss his art, that will never be replaced. Amy, I’m so sad for your loss but happy that you were able to have those wonderful memories and traditions with him again. Thank you for sharing that touching story of the 2 of you. Thinking of you. What wonderful memories, wonderful times. He was a good Dad, and you, dear Amy, are a good woman. He was justly proud of you. I met your dad at an astronaut autograph show at the Kennedy Space Center. He sign his Space art book for me, put his arm around my shoulder and smiled for a picture with me. I will miss your dad too, Amy. Amy, I join all those posting to express my sincere sorrow and condolences to you and your family as you grieve the loss of your Dad. I had the honor of meeting him once in Washington, DC. He was funny, incredibly humble, and one of the nicest people I’ve ever met. I just lost my Mom last month, so I know the sense of loss and emptiness you feel. Please know that there are untold numbers of us who are fans of your Dad and his work. Thank you for sharing this remembrance of him with us. Amy, your father touched the hearts and minds of millions of people around the globe; myself included. It was an honour and a privilege to have met him: just one of his many fans here in the UK. Such a sweet tribute. Thank you for sharing your thoughts with so many of us that admired him. 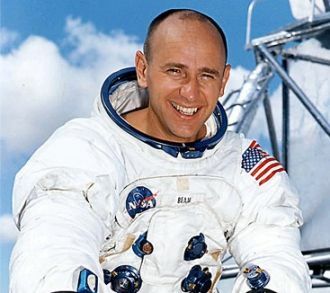 His jovial nature, contagious smile, and willingness to share his astronaut adventures, made him my favorite astronaut. Sending sincere condolences for your loss. Shipley Do-nuts is a Houston institution. Like you, my father thought they were the best donuts in the world. And he tried lots of donut shops in his travels! Thank you Heidi. A father’s death is a huge loss in life and your kind words mean so much. Thank you for generously sharing these memories. Dear Amy, Your father lived his life well; always with intention and focus. His many lessons will continue to guide you and those of us so rewarded by his friendship. Wheeler Historical Museum is honored to continue the story. His wisdom and light will direct us in all we do as we honor him and the first explorers that reached for the stars. The torch is passed and I know that you will have great influence on the lives of others as you share your unique journey. Oh, yes! “Amy, you will find a way”. Amy, thank you for sharing these thoughts about your amazing dad. What a blessing you were to him in so many different ways. May you and your family find much comfort in the days ahead through the love of others and the precious memories of the moments you enjoyed together. I’m so sorry for our loss of this great man- sending you are virtual hug. So sorry for your loss, thank you for sharing your wonderful father with the rest of us. Wishing you peace.